It is not until your spoon breaks through the outer crust of this Molten Chocolate Cake, that you find its soft and creamy center. 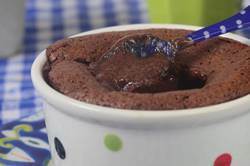 This dessert has been described as soufflé-like, cake-like, brownie-like, mousse-like, and pudding-like, and that is because it has all of these characteristics. Molten Chocolate Cakes, also known as Chocolate Lava Cakes, are wonderfully rich and chocolately. I love how the cakes rise as they bake (like a soufflé), but once they are removed from the oven they will slowly deflate. New York Chef Jean-Georges Vongerichten is credited with inventing this cake back in 1987. This Molten Cake recipe is different than most recipes in that it does not contain flour. This gives you a cake with an outside crust that is set, yet the center is wonderfully soft and creamy. You can adjust how soft the center of the cake is, by how long it is baked. The longer it's baked, the firmer the center will be. As its name implies, Molten Chocolate Cakes are served hot from the oven. You will notice that as the cakes cool, they will deflate, and the centers of the cakes will thicken. Delicious plain, but I love it with a scoop of icy cold vanilla ice cream placed in the center of the hot cake. The contrast of hot and cold is wonderful. You can also serve them with a dollop of softly whipped cream or clotted cream. Leftovers can be refrigerated and enjoy this cake cold, at room temperature, or reheated in the microwave. When making these cakes you can use individual ramekins, molds, custard cups, or even muffin tins. The cakes can be served in their molds, but if you want to remove them from their cups before serving, it is important to generously butter each mold so the baked cakes release easily onto your serving plate. You may want to first run a sharp knife around each cake before unmolding. Also, the batter can be made several hours in advance of baking. Just pour the batter into the individual molds, cover each mold with plastic wrap, and refrigerate until you are ready to bake them. Molten Chocolate Cakes: Preheat your oven to 400 degrees F (200 degrees C) and place the oven rack in the center of the oven. Generously butter four - 6 to 8 ounce (180-240 ml) molds, ramekins, or custard cups. Dust the insides with unsweetened cocoa powder (can also use granulated white sugar). Place the prepared molds on a baking sheet. In a heatproof bowl, placed over a saucepan of simmering water, melt the butter and chocolate. Remove from heat and set aside to cool while you beat the egg yolks. In the bowl of your electric stand mixer, fitted with the whisk attachment, or with a hand mixer, beat the egg yolks (at room temperature) and 1/3 cup (65 grams) sugar (Sugar 1) until thick, pale, and fluffy. (When you slowly raise the beaters the batter will fall back into the bowl in a slow ribbon.) Beat in the vanilla extract and then fold in the melted chocolate mixture. In another clean bowl, whip the egg whites (at room temperature) until frothy. Add the cream of tartar and continue to whip until soft peaks form. Gradually add the 1 tablespoon (15 grams) of granulated white sugar (Sugar 2) and whip just until stiff peaks form. With a rubber spatula or wire whisk gently fold the beaten whites into the chocolate mixture, just until incorporated. Divide the batter between the prepared molds. Bake for 10 to 15 minutes or until the outside edge of each cake is set, but the middles still look a little wet and wobbly. You may have cracks on the top surface of the cakes. Immediately remove from oven and let them rest for a minute or two. You can serve the cakes in their molds or you can run an offset spatula or sharp knife around the edge of each cake and then invert onto a plate. Carefully remove the mold. If you like, you can sprinkle the tops of the cakes with confectioners sugar and place a dollop of softly whipped cream, clotted cream, or vanilla ice cream in the center of each cake. Leftovers can be covered and stored in the refrigerator for several days. Can reheat in the microwave, or eat cold, or at room temperature. Note: You can prepare the cakes several hours ahead of time. Simply make the recipe, pour into the prepared molds, cover with plastic wrap, and refrigerate. Bake directly from the refrigerator. When the batter is cold the cakes may take a minute or two longer to bake. Makes 4 Molten Chocolate Cakes.